Ladies, check yourself. Save the Ta-Tas! Time to get those puppies checked! This pic has been all over facebook, and seems to have gone viral. I saw it linked via one of the dog sites, and managed to trace it back to it's origin, Kristen Alexander's Photography at http://www.kristenphoto.com, and the photo blog site of her dogs at http://xenaandluna.com/. Ok, the dog site is beyond cute. 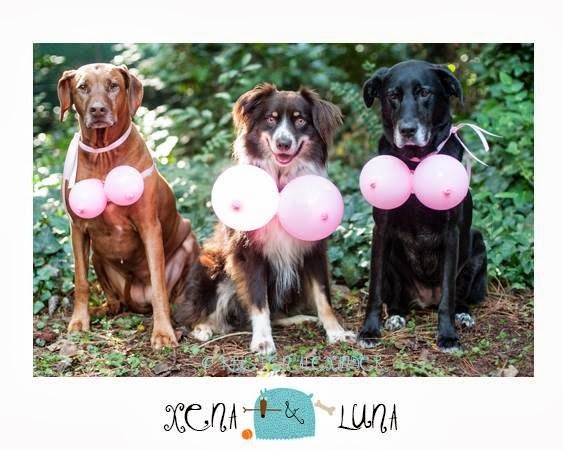 I mean first off, how do you get your dogs to stay put long enough to get a shot like that one? My Lettie used to hide when she saw me start to take pictures of her since she hated the flash. Rack would get distracted too easily. His best pics were spur of the moment and usually I had to take four or five of the "same" one just to get something passable! Mind you, that Border Collie in the middle has to have back problems with balloons like that on her! So ladies, check yourself and everyone can enjoy the pics. How can you not enjoy dogs with goofy balloons?